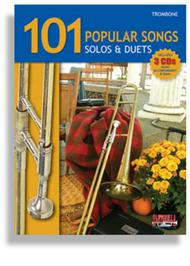 Santorella Publications is proud to present 101 Popular Songs for Trombone. After countless requests we have brought it all together under one roof. It has been decades since a brass or reed player could find so many recognizable songs, from assorted genres in a single collection. Also available in accommodating keys for Trumpet, Flute, Alto Sax & Clarinet in both solo & duet forms. 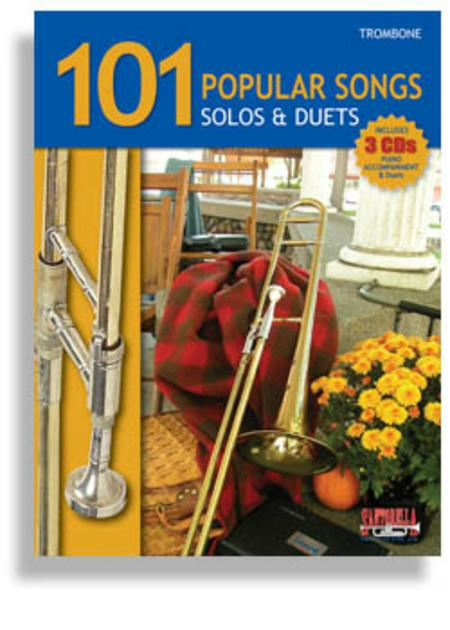 101 Popular Songs includes a variety of well-known Original Classics, Wedding Classics, Sacred Hymns, Patriotic Songs, Jazz Standards & Christmas Carols. Each edition includes three (3) Piano Accompaniment CDs - with over 100 tracks including classical & jazz duets. Every horn player will have a unique opportunity to play along with the greatest studio musicians in Los Angeles. Each edition is geared towards a particular instrument in the Classical & Jazz Duets sections which is recorded in a "music minus one" fashion. Little Cradle Song - Tell Me Fair Ladies - The Organ Grinder - Allegro, Mozart - Minuet, J.S. Bach - Andante, Mozart - Russian Song - Aria, J.S. Bach - Serenade - German Dance, Haydn - Gavotte - Old French Song - Turkish March - Andante, Haydn - Flight Of The Bumblebee - A Little Piece - Bouree - Symphony No. 40 - Allegretto - Spinning Song - Bridal Chorus - Wedding March - Ave Maria, Schubert - Jesu Joy of Man's Desiring - Pachelbel's Canon - Ode to Joy - Simple Gifts - Trumpet Voluntary - Two Minuets - Ave Maria, Bach - Moonlight Sonata - Nearer My God To Thee - Fairest Lord Jesus - Rock of Ages - Holy, Holy, Holy - Faith of Our Fathers - The Little Brown Church in the Vale - A Mighty Fortress is Our God - Abide With Me - The Lord is My Shepherd - Bringing in The Sheaves - Jesus Loves Me - Eternal Father Strong To Save (Navy Hymn) - He Leadeth Me - Stand Up For Jesus - America the Beautiful - Amazing Grace - When Johnny Comes Marching Home - Hail to the Chief - You're a Grand Old Flag - Marine's Hymn - Dixie - Battle Hymn of the Republic - Pomp and Circumstance - Yankee Doodle - America, My Country "Tis of Thee - Washington Post March - Columbia the Gem of the Ocean - Anchors Aweigh - Over There - Yankee Doodle Boy - The Star-Spangled Banner - Semper Fidelis - The Caissons Go Rolling Along - The Stars and Stripes Forever - The Thunderer - Hot Time in the Old Town Tonight - AIexander's Ragtime Band - I Want a Girl - For Me and My Gal - Chinatown My Chinatown - Little Brown Jug - Fascination - Melancholy Baby - You Made Me Love You - Bill Bailey - When The Saints Go Marching In - Rock-a-Bye Your Baby - St. Louis Blues - After You've Gone - Baby Face - Swanee - The Entertainer - Blue Boppin' Bossa - Ba-do-ba-dee-bop - Lazy Summer - The "Do Nothing" Blues - Kickin' Back - Away in a Manger - Deck the Halls - First Noel - Hark! The Herald Angels Sing - It Came Upon a Midnight Clear - Jingle Bells - Joy to the World - Let There Be Peace of Earth - O Come All Ye Faithful - O Little Town of Bethlehem - Silent Night - We Three Kings of Orient Are - We Wish You a Merry Christmas.